As many of New York’s most popular landmarks, Bryant Park was born in the 19th Century when the city was undergoing an extreme facelift. Since then, Bryant Park has evolved over time into a gorgeous public park with a very special touch. The park is divided into different areas where people can join a ping-pong game, take art or fitness classes or just sit on the grass and people-watch. Food vendors, cultural activities and seasonal events happen year round. When hunger strikes, Bryant Park answers. The Bryant Park Grill has a coveted rooftop garden and terrace where you can sink your teeth into American-style cuisine. The Bryant Park Café is run by the Grill but offers a more casual outdoor atmosphere. If you’re after a deli-style meal, head to the Southwest Porch for a chance to lounge outside and enjoy the views. While the Rink in Rockefeller Center and the Wollman Rink in Central Park are extremely popular, Bryant Park has a rink of its own during its annual Winter Village - the best part? It’s completely free. If, however, rented skates and falling in front of strangers isn’t your cup of tea, the Winter Village has food vendors selling all sorts of cozy holiday foods. This is also a perfect time to find original holiday gifts or just wander in one of New York’s favorite winter wonderlands. Summer is a different scene. Keeping up with New York’s outdoor summer craze, Bryant Park organizes an annual outdoor film festival. You’ll have to be ready to run to snag a decent picnic spot to rub shoulders with New Yorkers and watch classic films. This time of the year also means Broadway in Bryant Park - a concert featuring the best hits of Broadway productions. Walk two blocks down 6th Avenue. Piece of cake. For updated information on seasonal programs and events, click here. That said, your modern room at the Royalton is just steps away from your new love affair. 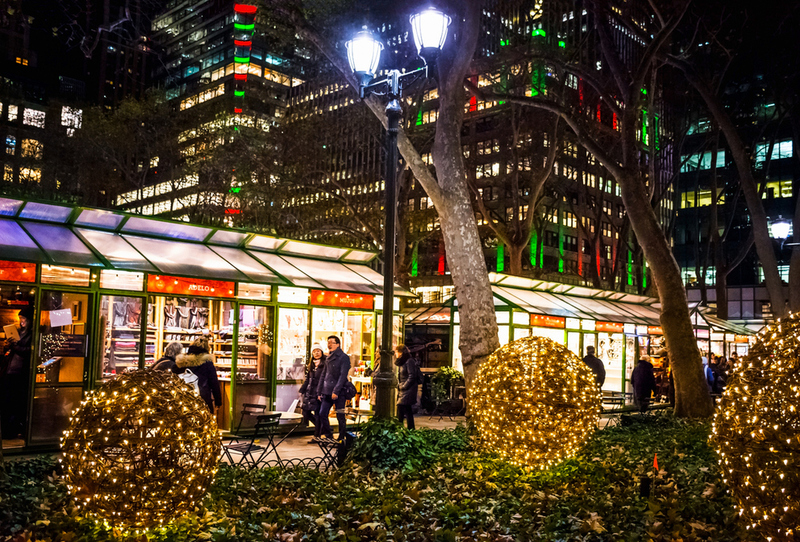 Bryant Park is a perfect place to find new things to do in Midtown before or after grabbing a bite in our Forty-Four Restaurant or having a few drinks at Bar 44.